Burt’s bees steered the make up look for the Steven Alan Fashion show. Steven Alan’s shared vision of natural beauty was the perfect complement to Burt’s Bees notion that nature is the original color expert. 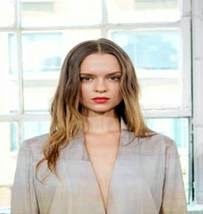 The likeminded brands agreed that the collection was best paired with a natural makeup look that placed full emphasis on the color of the lip. · Glowing, dewy skin was a critical part of the overall aesthetic and to deliver a truly ethereal glow, she prepped the skin with a Jenette Be Happy Toning Mist and applied a few drops of Burt’s Bees Radiance Serum. · Then, she applied a sheer wash of Vapour Organic Beauty Cream Foundation to the T-zone only using a Dermablend Foundation brush for the lightest of application. A dampened Beauty Blender was then patted over the foundation for the perfect natural looking finish. ·For luminosity and dimension, a lightly shimmer-infused sheer highlighting cream, Polkadots and Moonbeams from Ilia Beauty, was applied to the places on the face where light first reflects: bridge of the nose, cheekbones, apples of the cheeks, cupids bow and eyelids. Katey used a Vert feathery stippling brush for maximum effect and sheerest application. · For eyes, Katey applied no shadow or liner to keep the focus on the lip and skin. She simply curled the lashes and brushed the brows upward and at an angle to emphasize the models’ natural arch. W3ll People Brow Pigment Powder was lightly feathered into the outer 1/3 of the brow. · To finish the look and create the focal point Katey took the custom matched Burt’s Bees Lip Crayon and filled the models lips in with layers of color building to the desired intensity. She used her ring finger to pat a bit more color to the center of the lips for added definition. · Lastly, Katey applied Vapour Beauty Concealer to the under eye area to combat dark circles and around the nose to eliminate any remaining redness or discoloration.